- Commercial Contracts being targeted. EAST END, Tortola, VI - Sheryl L. Rosan & Co is the newest Law Firm to open its doors in Tortola and is being touted as the first for the East End jurisdiction. "It is my desire to serve the East End jurisdiction in whatever issue they may have. I am not limited to any particular area of the law, I am very diverse in my practice," said the owner of the Law Firm, Sheryl L. Rosan. According to Ms. Rosan, she has had experience working under a number of law firms during the past seven years of her career and the decision of moving off on her own was a decision of God. "Moving was a decision of God. My path being revealed to me by him and I followed through." In her passion to serve the area she said that clients can expect nothing but the best service especially in her areas of strength, those being land law, divorce, possible corruption, maintenance and family matters of all kinds. She is inclined to limited criminal matters and also offers services of Notaries Public and Commissioner of Oath, which provides for the certifying of legal and official documents. Very dear to Ms Rosan is her ability and position to serve in the provision of commercial contracts, an area of law for which she holds a Master's Degree. This was an area she said she never had the opportunity to practice despite promises by previous employers. "Now I have come to my reality and in my reality I have forgotten about the past and will make it this firm's reality to move forward to the commercial practice field." 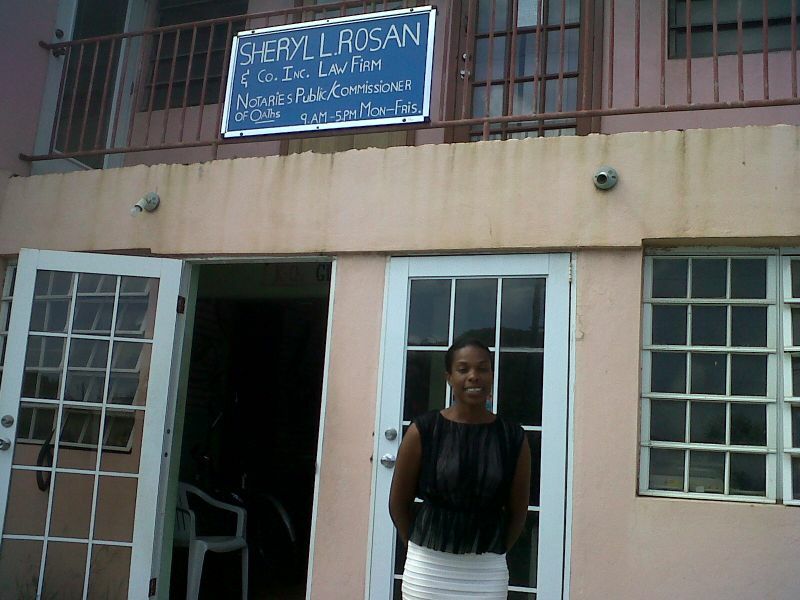 Ms Rosan is confident that the East End population can be assured that with the opening of the doors of the Law Firm, they are one step closer in the quest of becoming a self sufficient community. She expressed the view that the community has been neglected especially in two areas; not having a law firm and a bank. The lawyer said she is proud of herself having withstood the negative adversities and challenges youth face when approaching financing institutions and those in authority. "They look at us and say she has a strong mind of doing what she wants but I think she is a little too young so I would quicker advise her to go and seek employment." She expressed gratitude to Alex Erskine of Apple B, the late Cecil Dawson and Charmaine Rosan-Bumbury, "for what they have done to me and for what they have done for me." Congratulations Sheryl and may God continue to be with you. How they say the Rosans aint good look they produced two fine lawyers GO GIRD!!! is that why he have you HOT 4 so? This is what our government should be promoting: Helping our people to strive for careers instead of jobs while limiting the amount of law firms owned by foreigners so that Virgin Islanders(British) can begin to open their own firms. This is the only way the country can move forward!! I await the day when I can read of many of our young lawyers owning their own firms in the land of their's and their forefather's birth! I would like to take this opportunity given to me by the almighty-god,to congratulate a hard working British Overseas Territories Citizen of the BVI,whose parents worked tirelessly hard to ensure that this beautiful child of god received high level disciplne and basic primary and secondery education in preparation for much bigger things to come.Here we are! Self-owned law firm:In my district!I feel proud,when my people make progress. Is that sign Hand Written? It looks like Chalk and a Blackboard. Give the young lady a chance to catch her self na! To me it shows determination. Maybe she is importing a sign that will be reasonably priced. Where the building is? I live East End but cannot recognise the building is it there by Maxwell at Old Plantation? Quincy Lettsome Building..Next to the Library...Give the lady a chance...what does the sign have to do with the services she is offering. Good to see East Folks representing. Nice sign, was that made in East End too? A hope soem of you haters trip up n pop ayo mout.